This thread has no space for you, stupid troll. Do you have any newspaper cuttings or video footage of this TV station burning down? So you are saying the only recordings of his goals were in this one TV station that got burned down. That's gonna be hard to find. But many of the TV stations had some sort of fire in the 60s-90s for whatever reason. There are a couple of pages in Portuguese referencing them. Could also be a case of many tapes just plain lost or recorded over. I am not even sure all games were recorded by cameras back then. The TV station that I think covered games back then went out of business in the early 80s. But man, if you're going to think everything is a marketing / conspiracy ploy, nothing will probably satisfy your hunger here. Do you doubt he even scored that many goals even in what you consider the weak Paulista league ? I don't see why as there is plenty of footage proving he scored at or close to his typical rate even at the highest competitive levels. Also, Carlitos was suggesting 170 PK Goals for Pelé and now it became ~400PK Goals (30% of all Pelé's goal in friendlies etc)... I've source of only 111 PK Goals from ~1300 Goals from Pelé, a trustworthy source (which may contain some errors, but still seems be honest to me).. The counter: NOTHING! he has nothing in his hands, just stupid comments as ever. Carlitos, this is a serious site, we will not spread lies and misinformation, right? These are the misinformation and lies. In all the games played by Pelé, his clubs and national team made 3782 goals in 1366 games, that's 2,769 goals per game. In the case of Lionel Messi (a little outdated) I count 1847 goals made by his clubs and national team in 768 matches, that's 2,405 goals per game. 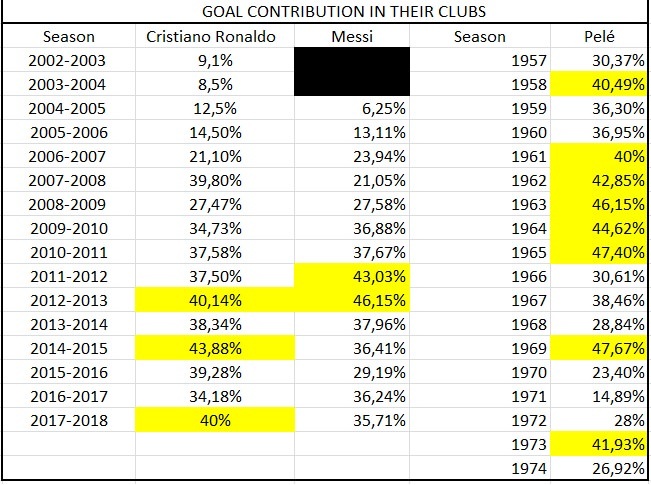 Messi generated 50,26% of the goals, or 55,72% being fair. 77 Goals and AT LEAST 33 assists by OPTA (probably a bit more) = 110/233 = at least 47,21%. Pelé 8 Times, Cristiano Ronaldo 3 Times, Messi 2 Times, Zico at least one time with Udinese (probably more with Flamengo), Maradona 0 in his peak. @carlito86 It has been mentioned that Pelé was not Brazil's nor Santos official PK taker. At Santos, I've seen it mentioned that earlier it was Pepe. Later years it was Carlos Alberto Torres. With that info, I searched in within 1 min I found a couple of examples of both of them taking a PK during a game (with Pelé on the field). I have no reason to believe that's a lie. For Brazil I think you can already see that most of his goals were not from the spot. From the video you of 60+ goals you posted earlier I think I saw 2 or 3 scored from the spot. @carlito86 It has been mentioned that Pelé was not Brazil's nor Santos official PK taker. Cruyff also didn't take penalties right? I am not sure about Cruyff. Leave me out of it !! When you guys start going too deep into stats, I lose interest and don't read. BTW ... Pelé did earn one of those PKs. I don't know where Pelé scored all of those PKs. Perhaps he took them when the official taker was off the field or he took them mostly in those international club friendlies. Some very deep research would be needed which is probably needless to be honest. Info about 111 including friendlies etc, Coutinho about 73 (48 in Pelé's time 1957-1965, 47 between 1958-1965, just official matches). Pelé scored 45 in official matches in that period. No info about all PK Goals from Santos in that time. Where is the verifiable Source material? you are literally quoting from another person who is as clueless as you are. Most newspapers at that time didn't give the exact description of the plays, unless you look in various sources and have luck (and it is a long time work to check all sources of that period), but in most if not in all, you will have a description of how the goal was scored. The source of my data seems to be very honest and credible and match with other player's numbers. Now if you prefer to believe what makes your opinions safer or want to do an ultra-revisionism to prove that this information is false, I support. To start with, a good job would be if you counted all Goals from all Matches when Cruyff was playing, can you do it for me? Puck surely has the numbers of assists (probably stricter than the assists that an Opta or a Transfermark could give, though) and goals from the Dutch player and maybe we can use this data. Separate the data by seasons, please. Yeah I just remember that Neeskens scored a few PK goals in WC74. For Pelé we simply don't know the exact number because there's lacking an adequate record of facts (something that's still true for today's Brazil, let alone the 1950s). There was a very good FourFourTwo article a couple of years ago. What we know for sure is that he had 6 penalty goals for Brazil (8% of his total), and I think also the Copa Libertadores is pretty much clear. It's a safe bet that he had around 100 penalty goals in his career, maybe slightly more (including the friendlies of course, since that is always included when ppl talk about Pelé). That's still a very low proportion compared to many other greats for sure (Baggio, Maradona etc. lower than Zico too). Anyone who says there is an exact number is lying. Cruijff has two penalty goals for Barcelona (1 in league, 1 in UEFA Cup) and then four more in the NASL. Some also include the famous Cruijff-Olsen penalty, making it seven. It was also a rare sight for him to take a free kick. There is a recorded free kick goal by him against Finland, and also one against then-champions Atletico Madrid. I don't think he cared much about scoring goals and even saw it as a way to prolong his career and be more valuable (= adding more wins). There are famous instances where he was criticized for not scoring enough, with him then bagging in one or two the next game as he promised. His scoring rate isn't particularly amazing (although after 1973 he was midfielder), but his 'wins above replacement' quite clearly is (with/without; also factoring in the many semi finals and top two finishes). That is as good as anyone in history. The xG is a FK is much lower than a PK though. I consider free-kicks an art of the best finishers, even more than the penalties. @jurjenhoekstra Penalty is 0.761 xG obv 4258 penalties. PSV's 1.69 is exclusief de penalty. About PK Goals from Cruyff it includes the shoot-out and friendlies too. it includes the shoot-out and friendlies too. About Zico my source said he scored 138 PK Goals of 844 Goals including friendlies that is 16,35%, Placar commented (about 1988) about 116 PK Goals of 710 Goals that is 16,33%, he missed about 11. Folha de Sao Paulo (archives are available for free online) and there were writeups/scorers listed. So maybe it might be possible to get a semi-accurate number (I suppose not all games were covered) if someone has way too much time on his hands. Very hard to read. It's very blurry.